This building is an early and intact example of an urban auto dealership, featuring a show room with large display windows, car storage in the rear, and a driveway. Automotive parts were stored on upper floors. It is notable for its large Chicago-style pivoting windows on the second floor. 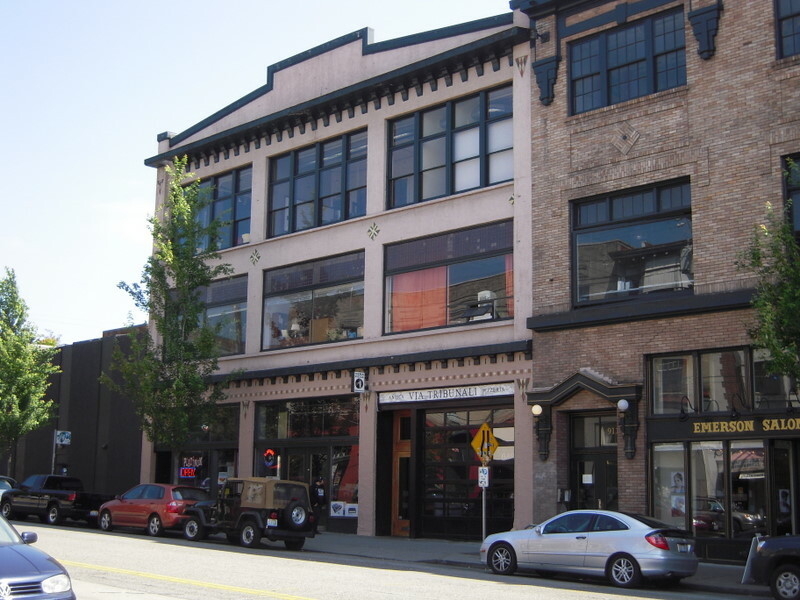 From 1905 until the late 1920s the Pike/Pine/Broadway area was the location for virtually all Seattle auto dealerships, as well as numerous service and parts facilities. The building has housed a variety of auto dealerships since its construction in 1912, including Chevrolet, Graham and Case/REO and, later, Triangle Automotive Parts. By the 1950s the auto industry had decentralized, and this building became a clothing factory and warehouse, for Evergreen Fashion and Otis Hancock & Associates. From 1978-80 it was the Empty Space Theater. The architect, Victor Voorhees, designed more than 110 buildings between 1904 and 1929. They ranged from cottages and residences to factories, stores, apartments and hotels. Among his best known works are the Vance Hotel, the Vance Building and Washington Hall. He was supervising architect for the Willys-Overland Company and designed many auto showrooms and garages in Seattle and elsewhere. This stucco-clad brick building achieves a feeling of both lightness and massiveness through its overall composition and unusual fenestration. The stepped parapet is anchored by a prominent bracketed cornice. The first floor has typical storefronts with recessed entries, wood bulkheads and large display windows with transoms. A dentillated cornice is between the first and second floors; below the cornice is a row of decorative tile. Arrow-shaped tile medallions are on each pilaster at transom level. The west end of the main elevation has an intact driveway entry. The second floor has three unusually large pivoting windows with very small pane transoms above. The third floor has three 12-light windows with heavy muntins. The entry to the upper floors is clad with tiles and has its original wood and glass door. All elements appear to be the same as in 1937.